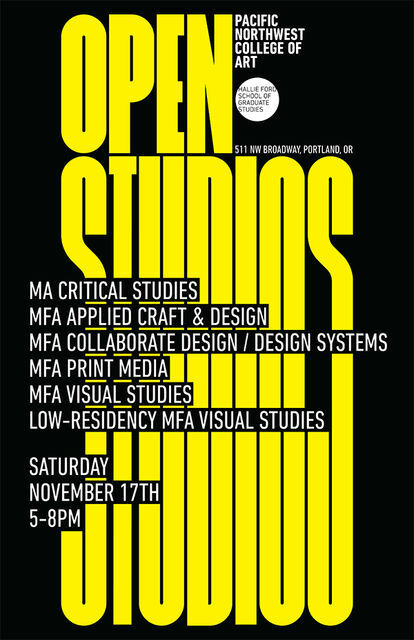 Please join The Pacific Northwest College of Art’s Hallie Ford School of Graduate Studies for their annual Open Studios! Every year PNCA’s graduate students invite the public into their studios and exhibition spaces for an evening filled with art, design and dialogue. This event is an opportunity to get a private view of what grad students have been working on and to engage with them in conversation about their individual practices and projects. This event will feature work that spans and addresses a wide variety of media, form, and concepts. Join us in an evening of lively, engaging conversation and visual art.